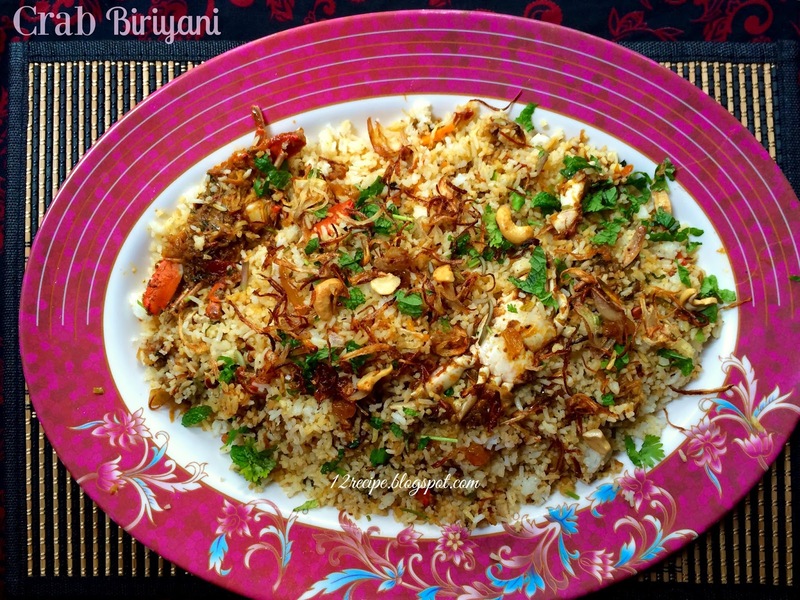 Biryani is a flavorful dish due to varied fragrant ingredients and basmati rice. it can be made in different variations according to different places. 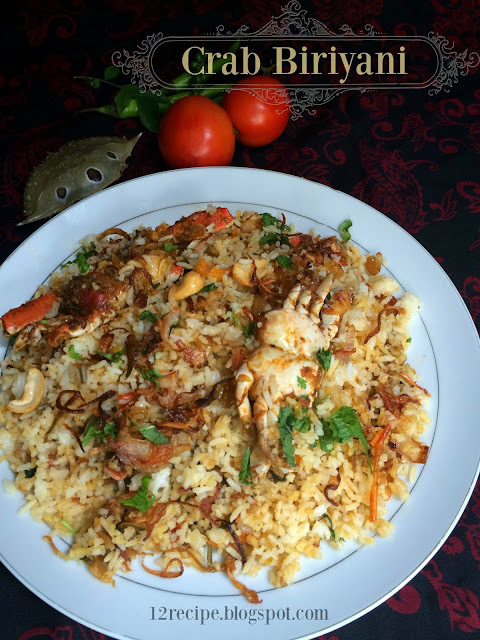 Here is a simple recipe of biriyani with the lovely seafood crab. In a pan heat 3 tablespoons of oil and sauté onion very well. When the tomatoes are mashed well add all the powders, curd, coriander leaves, mint leaves, cleaned crab and salt. Cover the lid and cook about 20 minutes (or until crab get cooked) in a low-medium flame (open the lid often and stir occasionally). Mean while soak the rice in water for 15 minutes and drain. Boil water in pan (enough to cook and drain rice); add salt, cinnamon stick, cardamom, bay leaves and cloves. cooks until done (3/4 th cooked) and drain the rice. In the dum pan (heavy bottom pan) add little oil; spread half part of prepared crab masala. Add half part of rice on top of it; sprinkle half of garnishing ingredients on top. Spread remaining masala followed by remaining rice and garnishing ingredients. After that give a good mix and serve.